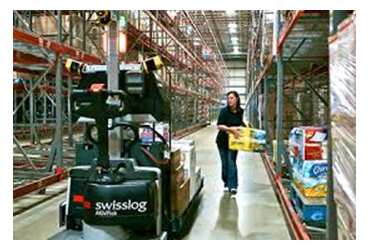 To obtain the shortest order picking route possible, you need a strategy that is capable of considering all possibilities for travelling in and between aisles. Based on various industry surveys conducted over the last few years, including those done by Supply Chain Digest, between half and two-thirds of order fulfillment DCs are manually order picking using a combination of pallet jacks and order picker trucks. What this says is that manual order picking methods are commonly used by both large and small distributors throughout the logistics industry in the United States. In Europe and Japan, where space and labor are at a premium, Automatic Case Picking (ACP) is much more common. Picking methods that bring products to the person such as horizontal and vertical carousels, AGVs and AS/RS are in common use along with more advanced robotic picking methods. and, existing order picking equipment (pallet jacks, pick carts, order picking trucks, etc.). Working within the existing framework and budget constraints, a practical alternative is to improve picking efficiency by deploying sophisticated product slotting and order picking route strategies – not an easy task given the huge number of customer order profile possibilities. The (3) most common methods of storage assignment are: random, volume-based, and class-based. Random storage is the easiest to use as items are just assigned to any open storage location. Volume-based storage involves ranking all of the items by demand and then assigning storage locations based on this ranking. Since warehouse assortment changes in variety and demand levels, volume-based storage may be difficult to implement making class-based storage a more practical alternative. Class-based storage is essentially a combination of random and volume-based storage. Items are divided into storage classes based on demand, but the items are assigned random storage locations within their class storage area. Because travel time can account for 50% or more of total order picking time, choosing the right routing strategy becomes critical especially if some type of slotting criteria is involved. Routing and slotting strategies can each individually reduce travel distances of order pickers, but a good combination of both is even more effective. The Rotterdam School of Management, Erasmus University, (www.rsm.nl/) is ranked among Europe's top 10 business schools, providing ground-breaking research and education, developed a simulation tool which is available on the Internet free of charge. The program appears to be relatively user-friendly and is capable of comparing numerous combinations of rectangular warehouse layouts, routing strategies, and storage policies. It can be found at http://www.fbk.eur.nl/OZ/LOGISTICA/. Most settings can be altered, often with a single mouse click. There are several commercial slotting software packages available today (go to Google – “Product Slotting Software”). Much more detail information on order picking efficiency with routing and storage policies can be found in a 17 page comprehensive report available through the Material Handling Industry of America (MHIA) at: www.mhia.org click on Learning Center and enter keywords – Order Picking 401 – then click search. If you are not interested in a DIY approach, there are numerous logistics consulting firms available to assist you in developing an optimum routing and slotting strategy. It’s important to note that most companies, who depend exclusively on manual picking methods, rely on WMS, RF Auto ID, pick-to-light and computer directed voice technologies to drive down cost while trying to maximize throughput. Still, most admit that they are continually searching for, and experimenting with, better ways to fine-tune their picking and slotting strategies.